What do you look for in a fireplace mantel? Design and materials should integrate with the rest of your home, not stand apart. Your fireplace mantel should bring out the best of your fireplace. Depending upon your taste and style you mantel could be very simple or really ornate. Do you even need a mantel? If you have an extremely modern styled home with sleek lines everywhere you might consider doing away with a mantel altogether. Let the fireplace speak for itself. More traditional homes can all benefit from a usable mantel above the fireplace. This gives you additional space for decorating and helps add a focal point. While you can obviously take a measurement, it’s always best to have the professional that’s installing the mantel to do the measurements. Professional builders and installers will be up to date on fire codes and thus better able to determine the proper size. Example: The NFPA (National Fire Protection Association) indicates that a mantel must be at least six inches from the fireplace opening. Combustible trim measuring at least 1.5” thick must be at least a foot from the fireplace opening. It’s best to blend the fireplace mantel (and surround) with the rest of your home. If your countertops are all granite… go with granite. If your wood trim and crown moldings is walnut.. go with walnut. You want your fireplace mantel to contribute to the overall look of the house, not stand out. Did you know that you can customize a mantel? You don’t need to take an ‘off the shelf’ model and think you have to live with it. Your professional can add details to your liking. Think corbels! The fireplace is typically considered the focal point of a room and the mantel and surround you choose can either draw attention to the area or cause the fireplace to seemingly blend in with the rest of the house. What’s your intent? Are you looking for a place to decorate according to the seasons? Are you looking for a spot to showcase your television or a particular piece of artwork? 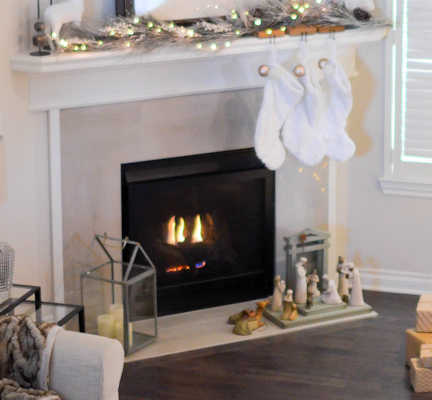 Take into consideration what your goal is before choosing a fireplace mantel. Your fireplace mantel should fit with the rest of the house.